Sign-up for discounts, giveaways & more! Located in a picturesque tree-lined neighborhood, this quaint brick bungalow is conveniently located near historic downtown and Hot Springs Convention Center, and in walking distance to Oaklawn Race Track and Gaming Center. Whether you are looking to spend your visit to Hot Springs in the peace and serenity of the lakes and national park or take in the vibrant and eclectic combination of museums and attractions downtown, Trivista House is centrally located to experience it all--and to do so in style and comfort! Trivista House has been fully renovated to incorporate modern amenities, ensuring a comfortable stay. With three large bedrooms, the house can sleep an impressive fourteen people. Each bedroom is furnished with fine linens, pillows, and comforters. Bathrooms are located both upstairs and down, and central heating and air conditioning throughout. Plenty of space to relax or socialize can be found in the dining room, family room or breakfast nook; curl up in front of the fireplace or lounge in the library with a good book. Stay connected to work or friends with wireless internet. After taking in the sights around Hot Springs, spend some time outdoors in your own quiet, fully fenced backyard complete with a patio and garden. Cook meals on the gas grill and dine under the pergola. The enclosed fire pit provides a place for guests to relax into the evening hours. Location, charm, and comfort make Trivista House a popular choice for a Hot Springs holiday! Airbeds are available upon request for groups exceeding the bed counts. There is a $35 charge per airbed. Really nothing to comment on... we had zero issues and check in and out was a breeze. Perfect location for a weekend at Oaklawn. The house is a very quiet neighborhood just a 10 minuite walk to the track. The house itself is very well kept and comfortable. For us the best feature is the outdoor area with a grill, fire pit, table and ample seating. House was large enough for my family of twelve for two nights. Close enough to the track that we walked there and back. Quiet neighborhood. Will be staying at the property in the future. Had a wonderful time. Stayed with my 4 sisters, mother and aunt. Would stay again if in that area. Very comfortable. The property was great for our family of five- everyone had a bed of their own, and space to spread out, but also space to come together. We loved the well-equipped kitchen and copious towels and handmade soaps, also. There is a great walking trail just outside the neighborhood that we enjoyed exercising on each day, as well. The location of the house was central to all the activities we wanted. We had a great family vacation! We enjoyed our stay. Everything was nice other than the 2 issues I spoke with you about in regards to the cold showers and the water bug. Your team members were easy to work with and very friendly. I will recommend BlueSky Vacation home to everyone. The property was beautiful. The home was soooooo beautiful. A great place for pictures for my son's wedding. I thought there would not be enough room for parking and then found the carport in the back. I can not tell you how wonderful it was to share this experience with my family and having a place for us all to visit. 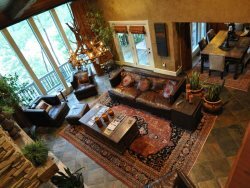 Any time I have the need to stay in Hot Springs I will book the Trivista Home. Everyone was so friendly and willing to help in any way. Loved the house, perfect location!! Can't wait to stay again! Loved the property! Beautiful decorating and comfortable. Thais was a perfect stay for us. The house was so cozy and inviting, it felt like you were home. It had all the perfect touches. The beds were extremely comfortable and kitchen nicely stocked. The only negatives were lack of a large trash receptacle outside and having to park on the street. Otherwise perfect. Would highly recommend. We looooved it! (To be read in an opera voice!) Lady Trivista was perfect for our girls' weekend! We lounged, laughed, and lolled over to Oaklawn. Great memories were made and we would definitely stay here again. We had so much fun! The house was perfect for our little gathering of friends. It was stocked full of everything we needed. We will go back! My wife and I were in Hot Springs in February to celebrate our 40th year aniversary. We honeymooned there and have been back a few times but wanted to come again. The Home on Trivista was wonderful, decorated very nice, and was a very comfortable place to come back after being out in the city. Loved the Horse Races, the visits downtown, and great food (Dining at Luna Bella was a treat). The owners were a delight to deal with. Would definitely stay again. It was our annual trip to Oaklawn. The location could not have been better. The size of the house was good for 8 adults. The size of the beds could be improved - queen size instead of double would help. The house was cute, but functional. A good time was had by all. We enjoyed our stay in the adorable cottage. The home was nicely equipped, beautifully decorated and in a great location. We can't wait to go back! wonderful older home in a lovely neighborhood. Very comfortable inside and out...great shaded table in the backyard got lots of use! Furnishings left absolutely nothing to be desired! Hope to return next year. On this our springtime get away The Downtown Divas came to stay. We found your house a perfect fit From everything we wanted from it! Lots of beds with lovely sheets A kitchen to prepare our eats. So chic and trendy....we were wowed For this decor...you should be proud! The Southern Charm was everywhere Inside, outside, up the stairs! Out Happy Hour in your back yard Just made our leaving much more hard So....we have decided to stay. And you will find us tucked away! Not really, but we will return, And on that note I will adjourn! Best rental ever! We look forward to returning in 2 years. Excellent setting. Wonderful backyard. Superb interior and facilities. Excellent neighborhood. This property is lovely. The yard is well manicured and tranquil. There are a few maintenance issues inside with a leak in a window of the study after a bery hard rain. I submitted a maintenance request and the company was very quick to respond and I am sure will take care of the problem. House was charming, clean, well-stocked, comfortable, and cozy. Great location for our needs. I had trouble with the entry keypad and accidentally took a hand towel home, and the owner was incredibly gracious and patient. While we may run special offers periodically, some restrictions apply. The owner reserves the right to terminate special promotions at any time.